of the World Bank, via WRI's City Fix blog). The BRT concept has been having a tough time in India lately. 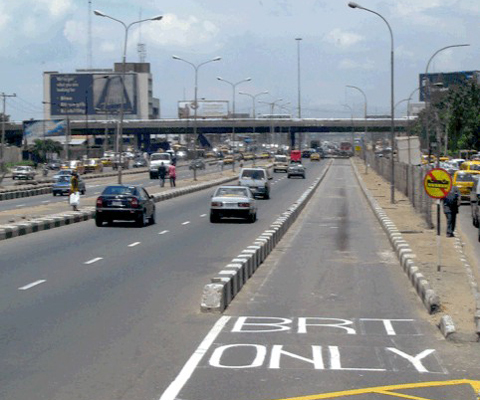 But according to the Nigerian Tribune on 29 May, World Bank officials are impressed with the success so far of the new Bus Rapid Transit (BRT) system in Lagos, which opened in March. The World Bank Task Team leader, World Bank for the Lagos Urban Transport Project (LUTP), Mr. Ajay Kumar, who made the disclosure concerning the project being implemented by the Lagos Metropolitan Area Transport Authority (LAMATA) said the project had been executed beyond the imagination of the team, particularly against the backdrop of tough political and socio-economic environment of Lagos. Speaking during a recent visit to Lagos to assess the operations of the BRT, Mr. Kumar said he would rather send officials of cities seeking to implement the BRT system to Lagos than to Bogotá in Colombia or Curitiba in Brazil. “You have a tough environment here. The political, socio-economic situations are very tough. The environmental factor is also very tough. In spite of all these, you have been able to implement a system which is running and enjoying very high patronage,” he said. Ajay commended the partnership LAMATA forged with the private sector, especially the National Union of Road Transport Workers (NURTW), which formed a cooperative to run the BRT system and a bank, which provided funding for the acquisition of the BRT buses. The World Bank official was full of praises for Governor Babatunde Raji Fashola (SAN) of Lagos State for the support he gave to the operations of the BRT with the release of additional 70 buses to the NURTW Cooperative to boost the system. He called for a constant fine-tuning of the system so that imperfections that may be discovered in operations would be tackled promptly. Earlier, the Managing Director of LAMATA, Dr. Dayo Mobereola, told the World Bank team that the initial project was for the system to carry about 60,000 passengers per day, however, it now carries about 130,000 passengers per day. The Lagos system has prevailed so far despite a great deal of early criticism, much of it remarkably similar to Delhi's. Of course, it will be a challenge to keep the system working well but the signs look promising. For more information on the Lagos BRT effort see this City Fix blog post which has a nice video link, some photos and a link to a presentation on the system.